By slowly converting our loneliness into a deep solitude, we create that precious space where we can discover the voice telling us about our own inner necessity — that is, our vocation. Unless our questions, problems, and concerns are tested and matured in solitude, it is not realistic to expect answers that are really our own. How many people can claim their ideas, opinions, and viewpoints as their own? … Even the most intimate concerns, such as the concerns about the meaning and value of life and death, can become victims of the fashion of the time. Frequently, we are restlessly looking for answers, going from door to door, from book to book, from school to school, without having really listened carefully and attentively to the questions. A poet once said that we need to live the questions now and perhaps in the future those questions would find answers. That same poet talked about vocation not as something that someone else affirmed but that our own lives or skills affirmed when we found that we had to do that or that it was in the deepest part of our hearts- so much so that we had to build our entire lives around this call in our lives and let our lives be testimony to that call we found deep inside ourselves. But we are often so afraid to make that space, to empty our schedules to be aware of what our own inner voice, or inner call is telling us. Perhaps it is the Holy Spirit or ourselves. Either way, we are called into a solitude of paying attention to our innermost self. Once we start paying attention to our innermost self and not denying the pressures the world puts on us, the feelings we have, the perspectives and ideas we have, the desires we strive for, then we begin to actually appreciate the space we have for ourselves and create that freeing space for others. In those moments when we move towards solitude, we actually catch a vision of what it means to be human and then we can express great joy at our commonality, our beauty- and we can also learn through that solitude to be more gentle, affectionate, and compassionate with others, simply because we have paid attention to innermost selves. Solitude doesn’t always have to be silence and it doesn’t always have to be living life like a hermit, but it does require some things from us. It requires that we try to let go of the insecurities of becoming occupied and busied by so much. It requires that we listen to ourselves, and instead of looking for answers from everything else, seek first to know ourselves and our responses. It requires that instead of separating from the world, we become part of it as people who in their own innermost are secure. We often try to get away from the sad and depressing news, but perhaps instead of being people who react and seek answers elsewhere, in solitude we can comfortably, gently, and compassionately respond as we think is really appropriate in love. Thus, solitude of the heart opens our world by being attentive to the space in our hearts. There we can hear ourselves and ponder and wonder and awe and understand the feelings and desires we have internally and the actions and events and relationships we see and share externally. We still struggle with loneliness, by instead of being restless to fill our lives with answers and activities, we become powerfully content in ourselves and find a peace not from others, but from the presence of God within us. That space and presence within us is the framework through which we give freedom and space to others to find their own joy and live their own questions. Gracious God, help me to center myself and give myself the space that reflects that I treasure myself, all so that I might truly be blossoming wilderness for others like your Son. So this was a winner too. Yakitori is simply Japanese skewers, typically street fare in Osaka or Tokyo. One of my favorite yakitori is pork belly as well as other types of beef. But this one is pretty darn good. 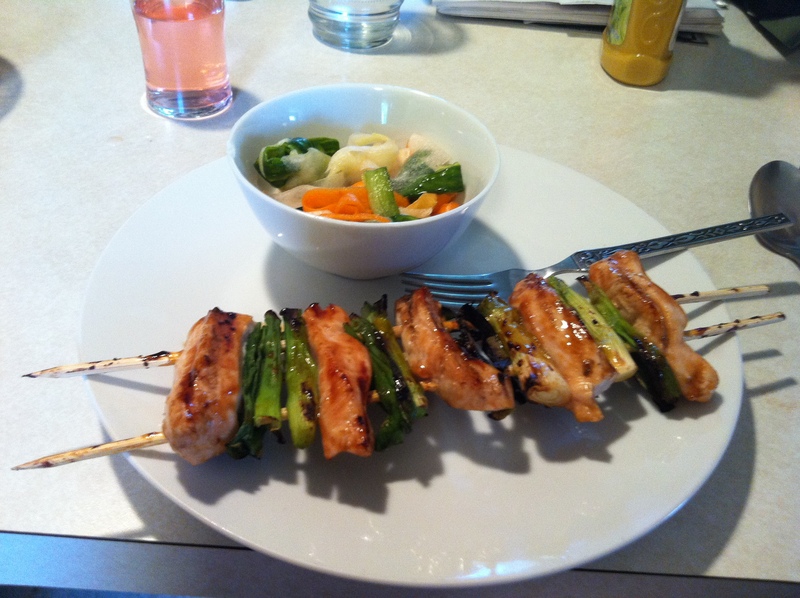 Grilled chicken and grilled green onions on the skewers, all basted during the grilling with tare sauce (soy sauce, chicken broth, sesame oil, sugar, mirin, crushed garlic and ginger). Excellent! Then, the pickled vegetables include an english cucumber, carrots, and a daikon radish all pickled in rice vinegar, plum sake, sugar, and kosher salt. Very good and crunchy, with a sweet and tangy flavor. Last, and just for kicks, I thought it would be great to have a little plum sake (the rose colored drink top left which is usually served in small glasses). All together, the meal gets an 8 out 10 from me. Look forward to doing it again some time. P.S. This was the first use of the new (but old) grill that I received from a friend who had it as an extra. So it was fun to do this grilling recipe too because I got to start the new grill! So what is home? Is home where I was born and raised? Is home where I want to be? Is home where my heart is? Is home where I need to be? In my case, I am struggling because I live 1500 miles away from family. I love them and desire to be around them quite a bit. But I am now in a place I love as much as I love Southern California. I love Houston. I love its diversity and different beauty. I love the roots of the church I attend and the welcome I feel there. I want to be a part of that church. I want to know that fellowship. If I were to go back to SoCal, I would find a welcoming family but a difficult spot in terms of churches. I am torn because there are only two places I would want to be. Before coming to Houston, I wasn’t sure I could ever go back to SoCal. But now, I am actually homesick a little for that beautiful place, for the friends from Pepperdine, and of course the family. I want to be able to golf and bowl with my brothers. And I don’t want to give up a Cali driver’s license and lose my SoCal identity. Houston is growing on me too. Opportunities for work, new and great friendships are developing, and a great church community has developed. Anyway, this all affects how I want to apply for jobs. I want to find and claim a home. Perhaps both are home. But I want to be somewhere for a while. And I want that somewhere to feel like home. This week I had the opportunity to attend two different lectures. The first was from a Harvard professor who talked about communing with the divine in Islam. He played sounds of the call to prayer of Islam in Arabic and talked about the aurality of the Quran in Islam. In essence, he described how the words themselves carried an essence of the divine that was meant to be expressed and heard- that the expression of the text of Holy Scripture was actually expressing faith and the beauty of God. What is intriguing about this is that the Quran is understood as poetic expression of the word of Allah. The key from this lecture then is not about the aesthetic appeal of the words, but the aurality of the Scripture: that God is communicated in the expression and hearing of the words. Hence, the beauty of Scripture being sung and developed into music and chanting. There are lessons there that emerge from our own tradition in Christianity- in reality, there was no written Scripture in the early centuries, and the Word was intended to be heard and expressed in music and chanting and reading Scripture OUT LOUD. We have lost that part of our own faith- we read Scripture to ourselves but there is something truly special about expressing God in expressing Scripture and letting what we hear hit us straight in the heart. In that way, the beauty of hearing Scripture performed and expressed connects our hearts straight to God. The second lecture was about Calligraphy and the Call, and had three calligraphers (two Islamic, one Jewish) who talked about their work in expressing Scripture and language in writing and visual work. Similar to aurality, artisticly written words can inspire and connect us to the images of God beyond. Hence, in Islamic mosques the decorations and paintings aren’t actually pictures of anything, but artistic letters and words or Scripture. In those words, one might find God’s voice. Or more simply, by artistically expressing the Hebrew or Arabic letters or phrases, one finds beauty, and where one finds or expresses beauty, they sense a connection with God. Incredible! Between the aural (hearing) and written (seeing), there are insights from other faith groups (particularly Islam and Judaism) that can inform and help us understand our own faith. God can be found in our tradition too in the expressed beauty of hearing and seeing Scripture or ritual. God is not simply in my heart, but is in the expressing of beauty and the expressing of Scripture. Further, these insights also force us to think about the role of the beautiful in our faith. Sometimes, I think my tradition sees beauty in the worship experience as secondary and/or irrelevant to the experience, meaning it doesn’t matter necessarily. But, if these other groups give us insight (and remind us of the deep traditions in our own faith), then the beautiful is a significant and invaluable part of the faith experience because it is a crucial way we perceive and experience God. So the role of the beautiful is two fold: first, it connects us to God through our senses, which we tend to ignore and then miss connecting with God; and two; it attracts others to our faith through the stunning awe and wonder of expressed beauty that in its simplicity bears an incredibly deep message of the presence and character of God. Why do I write this? Because we must remember in our own Christian churches to let beauty be a part of our services because it is inseparable from communing with God. And because in recognizing how others see beauty and express God, perhaps we can find beauty and understanding in them, in the Islamic and Jewish faiths too. This meal was incredible: blackened fish sandwich! I made my own blackening seasoning, rubbed it on tilapia fillets and grilled it. 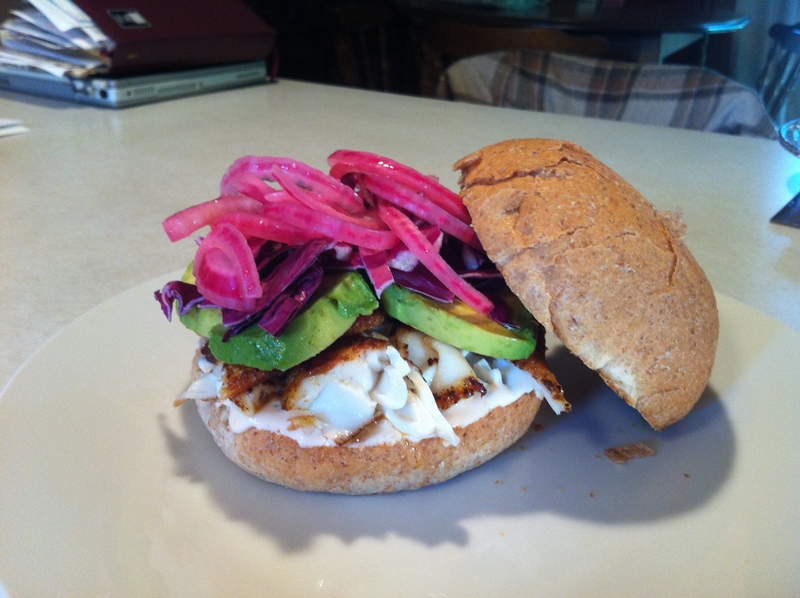 Then I put on some avocado slices, shredded red cabbage, pickled red onions (sweet and tangy! ), and a homemade sauce (greek yogurt, lime juice, sriracha sauce) on whole wheat buns. Incredible meal. 9 out of 10 in my opinion. Spanish Roast Chicken with a Spanish Grenache wine and for dessert Spanish Polvorone cookies (almond/cinnamon cookies). This is an absolutely fantastic meal. Bed of red potatoes plus a 3lb whole chicken (with parsely stalks and lemon wedges stuffed inside) drizzled with olive oil, salt and pepper and then late in the baking time adding spicy chorizo. 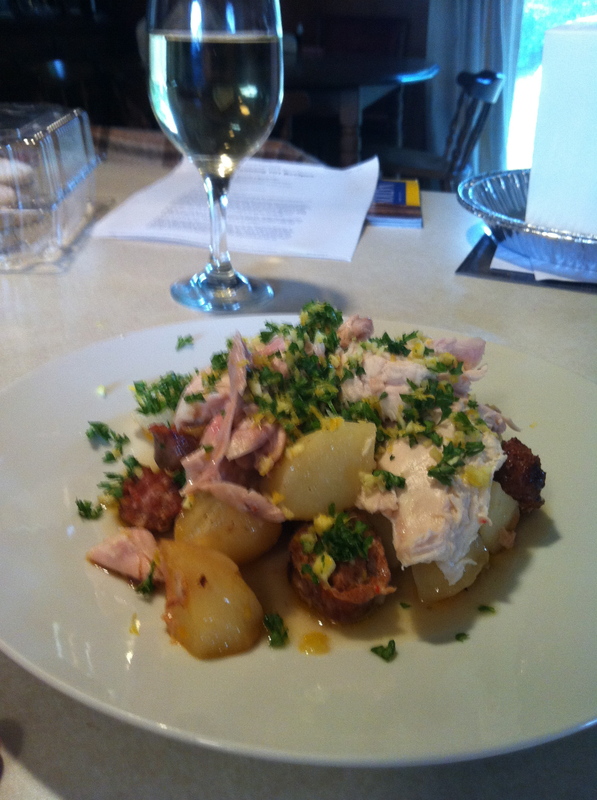 After pulling it out of the oven I added a gremolata- basically lemon zest, garlic, and parsley- to the top of the meal. Added to wine and cookies, this was 9 out of 10 too. Loved it!!!! 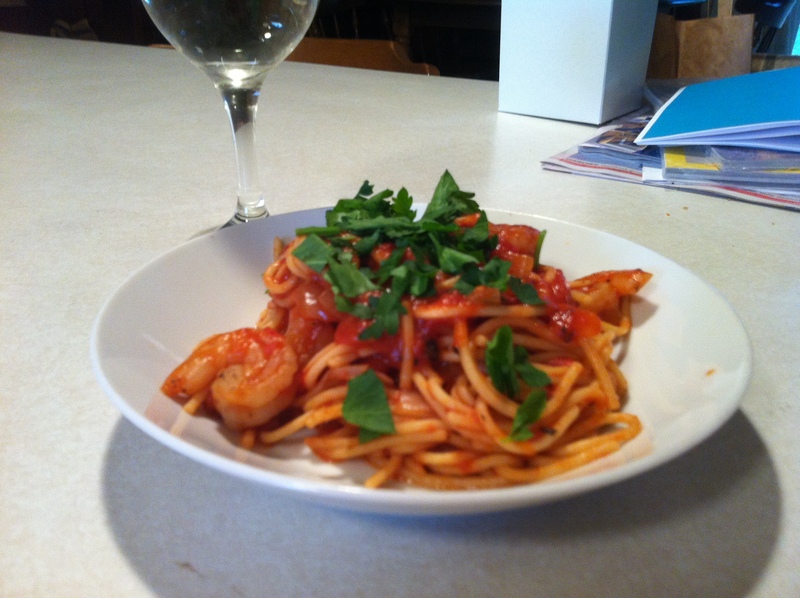 Shrimp Fra Diavolo. Wonderful and really spicy italian shrimp spaghetti. The dinner basically includes roasted and diced tomatoes, white wine, onions, garlic, and red pepper flakes with italian parsley on top. Really good and it has a nice smoky taste. 5 out of 5 I believe! Not seldom are our visions of the future born out of the sufferings of the present and our hope for others out of our own despair. Only few ‘happy endings’ make us happy, but often someone’s careful, and honest articulation of the ambiguities, uncertainties and painful conditions of life give us new hope. The paradox is indeed that new life is born out of the pains of old. Nouwen touches on something here that gives birth to the title of my blog. Namely, that out of my own feelings of wilderness in my faith journey and the despair of losing grandparents and fearing the loss of a father with seizures and dealing with divisive family issues has given birth to life in me. That life is a newfound pleasure in God’s grace. That life is a newfound welcome from knowing that I am not alone in that wilderness. That life includes feeling loved by God and by others in new ways that accept all that I am no matter what strange or stupid or great things I may do. Somehow, the ambiguous and uncertain has allowed me to bypass having to fit in black and white versions of “new creation,” and allowed me to escape having to be what others want me to be (which is what happens in a cut and dry, black and white extreme culture). The ambiguous and uncertain, including the pain, gives new meaning to life and allows me to see myself and that life in a different, more open and graced lens. I like that. I like the paradox. It truly does give hope.